I read this article and found it very interesting, thought it might be something for you. The article is called Seven Key Tasks For Delhi’s New Government and is located at https://archive.indiaspend.com/cover-story/seven-key-tasks-for-delhis-new-government-66630. The Aam Aadmi Party’s (AAP) grand sweep to power in Delhi – in less than two years after being number two – is a clear indication that impatient voters have soaring expectations. If those expectations are not quickly fulfilled, disillusionment is likely to be as quick. Although Delhi is India’s richest urban area with the best infrastructure in the country, there are deep, difficult problems that face the world’s second-most populous city. Here are seven issues that the new AAP government will have to urgently address – unless it wants to be the focus of disillusionment next time. 1. Healthcare: With 60% of Delhi’s population earning less than Rs 13,500 a month, it is evident they cannot afford expensive private hospitals. Official data reveal that the number of available beds in Delhi government and central government hospitals has declined by 8% and 47%, respectively over three years. On the other hand, availability of beds in private hospitals has increased by 36% in the past five years. 2. Unemployment: Rising unemployment is a big worry among Delhi’s voters. IndiaSpend had earlier reported that female unemployment has doubled over six years, although this could reflect women withdrawing from the workforce as their families prosper. The number of employment exchanges has remained constant over the past three years, but the number of registrations has increased by 71% from 93,000 in 2009 to 159,000 in 2013. This is an indication—many of those who are jobless do not bother registering with employment exchanges—that the new government will have to focus on creating more jobs and boosting the local economy. 3. Crimes against women: Delhi has a reputation for being unsafe for women. 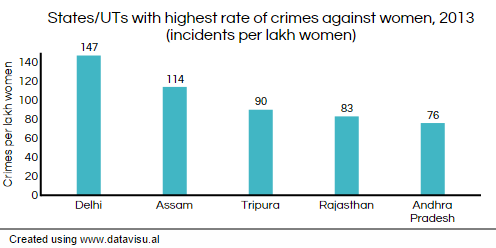 Delhi has the highest incidence rate of crimes against women in the country at 147 incidents per lakh women, followed by Assam, Tripura, Rajasthan and Andhra Pradesh, as per the National Crime Records Bureau (NCRB) 2013 report. The new government will have its task cut out to reduce the crime rate and make Delhi a safer city for women. 4. 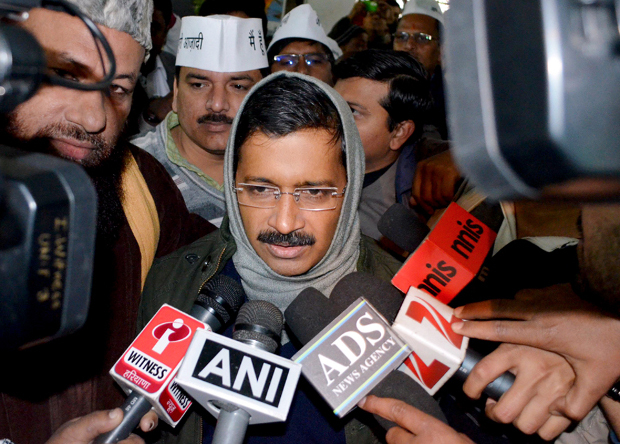 Water: Water has been one of the major election planks in Delhi. IndiaSpend had earlier reported how 24.8% of Delhi’s households (around 3.25 million people) do not receive piped water and each person gets, on average, 3.82 litres a day; 36 litres less than the minimum 40 litres suggested by the World Health Organisation. While the number of metered connections has increased 12% over the last five years, the number of unmetered connections has risen 31%, from 0.36 million in 2009-10 to 0.47 million in 2013-14. 5. Education: Though the number of government schools increased 8% over the past five years, from 4,993 in 2009 to 5,401 in 2014, the quality of learning is not likely to be any different from the abysmal quality reported across India. As this report mentions, there are no credible data on the learning outcomes of students in Delhi’s government schools. The new government has to focus on improving the quality of education rather than just building schools. 6. Electricity: Delhi has one of the highest electricity rates for consumers in the country, as the data obtained from various electricity boards across the country reveals. Delhi faces seasonal weather conditions that increase the demand for power. Delhi’s power companies purchase 86% of their electricity from other states, 30 billion units out of a total 35 billion units, which is considered a major reason for inflated electricity costs. 7. Pollution: Delhi is now the world’s most polluted city, according to the World Health Organisation, and millions of lives are at stake, although this does not show up as a major concern for voters. But with Delhi now akin to a gas chamber, no new government will be able to ignore the city’s ever-worsening air quality, likely to be made worse by a sky-rocketing number of vehicles with 8.3 million registered vehicles and 1,200 new vehicles being added daily. A basic requirement would be to put in place monitoring equipment. No accurate, real-time data is currently available to Delhi’s people on the quality of their air, specifically minute and toxic particulate matter called PM2.5, which causes a variety of respiratory and cardiac illnesses.